We like a good deal as much as the next cheapskate, but the ascendance of Black Friday as a de facto national holiday is definitely disturbing. Which is why we think outdoor retailer REI‘s plan to close its doors and give employees a paid day off on Black Friday, a move known as Opt Outside, is pretty baller. And we all know that a baller move like that deserves a beer — something the craft beer industry is always ready to accommodate. 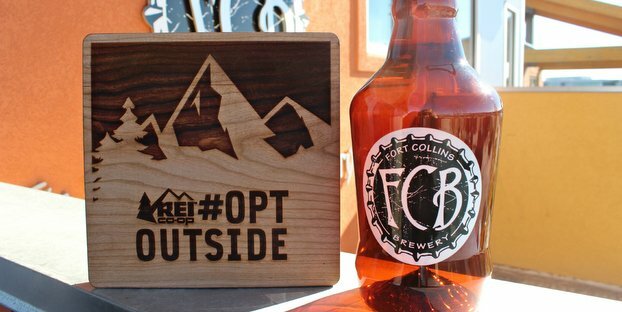 REI’s Opt Outside campaign inspired Tina Peters, co-owner and general manager of FCB: Fort Collins Brewery, who immediately applauded the notion and wanted to support REI and their inspirational move to Opt Outside this Black Friday. “Craft beer is an equally passionate industry about quality of life and a belief in doing what you love both professionally and personally,” Peters said. With these two core principles in mind, FCB extended a promotion valid to all local Colorado REI co-ops to enhance any REI employee’s Black Friday spent outside, not in the aisles of department and retail stores alike. Any REI employee presenting their employee card at FCB, Modern Tavern on Black Friday will receive a FREE growler fill of any FCB craft beer or housemade root beer in one of FCB’s plastic, recyclable and portable growlers. Word quickly spread of this promotion at the local Fort Collins REI co-op, with general manager Jason Orr and National CEO Jerry Stritzke coming to the brewery to present FCB with a thank you plaque. “REI’s Opt Outside campaign struck a cord with us, and we wanted to contribute by offering the opportunity for REI staff members to receive some complimentary FCB craft beer or root beer to pair with their outdoor activities for the day,” Peters said. It is the hope of both REI and FCB that the Opt Outside campaign strikes a chord with not only other businesses, but also individuals to get outside and give thanks for the great gift of exploring the outdoors — leaving the lines for another day. Fort Collins Brewery sells operations to Canada’s Red Truck Beer Co.
Jason Orr liked this on Facebook. Fort Collins Brewery – FCB liked this on Facebook. Virtual “high five” back to all our friends at REI!! Can’t wait to share beers with you!! Martha Dixon liked this on Facebook. Micah Weathers liked this on Facebook. Oleg Bootlegger liked this on Facebook.